Honeywell Getting Ready to Release the LYNX Touch L5200 and L7000 Security Panels! For many of us New Years is when we promise to start trying to lose weight, eat better, stop procrastinating or whatever else you might have resolved for the coming days. Honeywell, on the other hand, has announced its release of two new security systems, the Honeywell L5200 and the L7000. the soon-to-be-released Honeywell LYNX Touch 7000/L5200: You can view video on display and connect 84 zones. It has a 7-inch display; two-way voice over wifi, and a number of other newer features. Does this mean you should hold off on getting the L5100 or VISTA system? We wouldn't recommend it. there is no indication from Honeywell when these systems will be out, though we are hoping to see them in the first half of this year. And since the L5100 just saw a new update back in September, chances are, the release of the L5200 will simply be a slightly updated L5100. New features? Maybe some. More zones? Definitely. But since the L5100 already handles 64 zones, there are very few for whom the L5100's zone count is limiting. So if you're looking for a great system, the L5100 is still the best wireless security system that any security company has to offer. But that will, very soon, no longer be the case. The other advantage of the L5100, for the moment, is that the ecosystem of products is highly developed. Honeywell's L5100 Connect app, was released years after the L5100 was created. The app, which allows for local control of the L5100 from any iOS or Android tablet device, is robust, beautiful, and elegant. Will the L5200 have anything like it when it's released? While we're working to confirm with Honeywell whether it will or not, if I were to bet money on it, I think the best assumption is to expect no added features. The L5200s features will in all probability be very weak at first, like any security system that is newly released. The L5100 is likely to be the better system for at least a year after the L5200s release. So I wouldn't be too reticent to purchase the current system. But chances are that once the L5200 is released, it won't be long before the L5100 is no longer available which means that you'll have to upgrade, like it or not. This has been an eventful year for Honeywell, as they just released their 6162 and 6152 keypads for the VISTA series panels. Again, making programming and changing settings easier for the end user, Honeywell is proving their commitment to the newly emerging community of DIY home security enthusiasts. The L7000 sounds vaguely familiar, as Honeywell retired their 7-inch tablet mid-last year recognizing its poor reputation and slowness. The mid-7h (as it was called), while not well loved, had a beautiful giant screen, but being it was nothing more than a glorified Android tablet, its reception was fairly lukewarm. Presuming Honeywell can take the beautiful, much-loved 7-inch display and marry it to the wonderful functionality of their other AUI mounted security systems and keypads (such as the L5100 or the Tuxedo Touch) the L7000 sounds like it will be a welcome addition to their line of products. The new system may require new communicators, though we aren't sure about that either. All we really sort-of know is that the L7000 and the L5200 are going to be basically the same system. The L7000 may have a few more features than the L5200 (like maybe it will handle more total connect cameras, since we presume that this will allow for cameras to run through it like the Tuxedo currently does), but like I said, we don't have much information yet either. But it is an exciting bit of news since it shows that Honeywell is committed to continuing its excellent updates to already state-of-the-art hardware. For Thanksgiving this year, our Alarm Grid's president, Sterling Donnelly, has decided to fry a turkey in our special Alarm Grid turkey fryer. It's dangerous, yes, but if you've seen any of our Alarm Grid videos, you would know that Sterling is a dangerous man, performing all of his own stunts. That said, we're still all a little bit nervous, and have decided to close down the office for the day in order to make sure that Sterling doesn't do something foolish and burn the company to the ground. So if you try to call in tomorrow and you get the answering machine, now you know why. We should be back up and running Friday, and we'll be on in a limited capacity on Saturday and Sunday as usual. Honeywell's Released Some New Wired Keypads: the 6162 and 6152 Series Keypads Are Sleeker and Better Looking Than Ever! Like Honeywell's VISTA series AUI keypad, the Tuxedo Touch, these keypads feature sleek, rounded corners. While Honeywell has used the old 6160 for years and years, rarely updating their keypad interface, this new keypad marks a new era in Honeywell design as they are moving to a more end-user friendly design. The large backlit display of the new Honeywell 6162 makes understanding what is being done on the keypad much more simple, even for those who are not that familiar with the wired systems. What's that all mean? This is better for all you DIYers out there! It gives you way more options. If you are more comfortable with a wired system, or simply like some of the added functionality of a wired system over the wireless series panels, such as the L5100, then now is the time to become a home security DIY genius. It will work with any new VISTA-15P or VISTA-20P panel that sports revision 9.16 or higher. The VISTA-21iP panels need to be revision 3.16 or higher and the VISTA-10P panels need to be 4.16 or higher. The new keypads also come in a variety of choices. For those wanting the voice annunciation features that are built into some of the newer systems like the L5100, the 6162V or 6152V should be your weapon of choice. For those looking to add any of Honeywell's wireless sensors, the 6162RF and 6152RF are where you'll want to look. Like the 6160 and 6150 series keypads, the 6162 is the alphanumeric programming keypad, and the 6152 is the less expensive, fixed-English keypad. Both of them look great and are a better user experience, but only one of them is recommended for programming. It's an exciting time to be a Honeywell customer, big changes are coming! Honeywell seems more and more dedicated to making sure that end-users have full control of their monitored security systems. As I think toward the holidays, memories of Turkeys, green bean casserole (hot dish as they call it in my home state of Minnesota), cranberry sauce, and those delicious sweet potatoes sitting underneath a bed of oven-baked marshmallows make my mouth water. It's my favorite holiday, and the accompanying discussion of things we are thankful for make the holiday as sweet as any holiday that ever was. But let us consider for a second the famous story penned by one of America's most prolific writers, Dr. Seuss: The Grinch Who Stole Christmas. When all of the Whos were fast asleep, the Grinch into each of their homes slowly creeped. And he took all their gifts and their Christmas trees too. But we at Alarm Grid don't want this to happen to you. Most Americans begin buying their gifts on that fateful day after Thanksgiving known as Black Friday. And as homes fill with presents, this joyous season has become a bit of a hot time for burglars. And just like the Grinch who stole Christmas, thieves have cast a pall over the holidays for many families who spent time and money to make the holidays a special time for their families. Much of this can be prevented. So as you get ready to celebrate Thanksgiving, and then charge to the local outlet mall where you will fill your bags full of new computers and tvs or clothes, think about signing up for a service that will protect your home. The mere presence of a security system is a huge deterrent for thieves. And getting it monitored is likely to save Christmas for thousands of families in the coming month. Have You Gotten Your Alarm Monitoring Home Insurance Discount? If you're a homeowner trying to make up your mind about whether to get a monitored home security system or not, it's worth picking up the phone and calling your homeowners insurance provider. If you didn't know it already, most insurers provide a significant homeowners insurance discount to those who have a home security system. While the discount can range in value, some homeowners receive $5 off their insurance each month, while others have the full cost of their monitored system covered (about $20 per month). If you are on the fence about a system, giving your insurer a call is a great way to understand the subsidy you can get if you get one. The evidence regarding home security systems and their effectiveness as deterrents against thieves is unquestionable. In a study done in the UK recently, more 100 former burglars were interviewed. These "professional" burglars, the research showed, felt that they were entitled to taking valuables from poorly protected homes. In only 5 minutes, burglars say they can cover an entire property. Old looking alarms, some of the thieves said, were simple to disable. But anything that looks new and is known to have the advanced protection logic features of top-of-the-line products like Honeywell's LynxTouch 5100, were much more likely to deter would-be crooks. That said, it's pretty clear why insurance providers are so willing to offer a discount to homeowners who install a monitored system in their house. It makes the home that much less likely to be burgled which saves them an incredible amount of money in claims caused by robberies. So if you're on the fence about getting a system, don't think too long on it. The emotional toll of a break-in can be altogether avoided by making sure the break-in doesn't happen in the first place. And if your insurer wants to pay for the monitoring, then that should make the deal even sweeter. If you're already monitored by Alarm Grid, and you're interested in getting your insurance discount, it's very simple to do. Simply send us the email or fax number of your insurance provider, and we'll send them a certificate of alarm. If you are not yet monitored, and want to know what's involved, give us a call at 888-818-7728. We will get you up and running within 24 hours, and will send your certificate of alarm to your insurance provider ASAP so that you can participate in the incredible savings they provide. 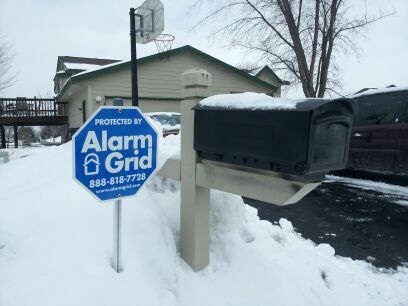 At the very least, at least consider purchasing one of our security yard signs or some security window stickers so that even if you don't have a monitored system, you can get some of the advantages that simply making it look like your home is monitored will bring.